Master Trax™ commercial grade carpet tiles are crafted specifically for oversized entrances and foyers where one piece of mat is required versus multiple individual mats. 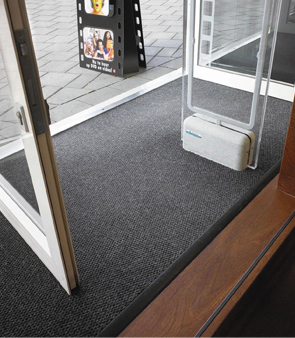 Perfect for custom carpeting around obstacles such as built-in cabinets, support beams or anti-theft sensors. With a robust 45 ounces of needle-punch berber yarn per square yard, Master Trax™ can withstand high traffic areas such as entrances to stores/shopping malls, hospitals, schools, and office buildings. 45 ounces per square yard of berber needle-punch yarn. Straight cut heat sealed edges are standard. Optional factory applied beveled edge borders are available for a more gradual transition. Rubber backing is textured on the underside to help minimize mat movement. Beveled edge borders available in complementary colors: Gray, Black, Brown, Green, and Burgundy. Mat is fully assembled at the factory to your custom size specification. Orders must be accompanied by a sketch clearly indicating width, length, and if applicable, which edges require the Edge Guardian nosing.